Water storage tank installations from the basement to the 53rd floor. Supply, deliver, positioning/cranage and install of the water storage tanks, levelling steels, connections and radio communication. 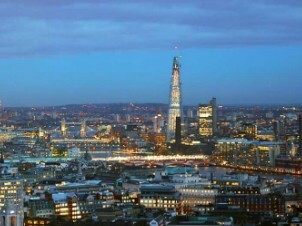 The vision for The Shard was to create an architecturally striking vertical city incorporating retail, offices, hotel, apartments, restaurants and a public viewing gallery. Situated south of London Bridge and designed by Renzo Piano, the Shard has become one of London’s most iconic buildings. Dewey Waters, a market leader in the water storage industry, is delighted to have been involved in such a prestigious project. The building is located in the vicinity of one of central London’s largest hospitals, St Guy’s and St Thomas Hospital and the London Bridge network rail station. Our involvement in the project was over a period of years due to the management and coordination of contractors. Many challenges were faced due to the unusual design of the building and the heavily populated and restricted area. Our excellent working relationships enabled us to overcome these challenges and led to securing further large contracts.